I have never in my life been accused of being a champagne socialist but it's probably only a matter of time. My father was a salesman and mother was a nurse. When we were small, my mother cut my hair. I was of the first generation of my family to go to university. We never had foreign holidays but we never went hungry either. School represented no real quandary - we went to the nearest. These days my lifestyle is a bit different. I am a surgical registrar and my income is both a lot more than the average in this country and more than most people I know. I own a second property which is let out and I have an expensive hobby. To be honest, I'm more of a scotch-socialist than the champagne variety. On the other hand, I work more hours than almost everyone I know and a lot more than I'm paid for. I have got here by a combination of very hard work, talent, persistence and yes, opportunity. I do a difficult and often stressful job that has significant (in my view) social value. For example, I took an appendix out of a 9 year old last week. 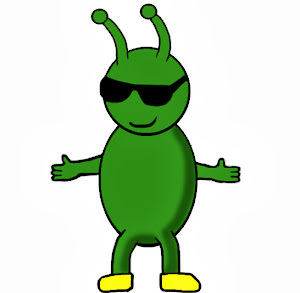 He's fine now; before surgery was invented, appendicitis had a 60-90% mortality. The other night I assisted a consultant operating on a seriously ill newborn baby. This is a very typical week. The thing is, I really believe higher earners should pay higher taxes. Including me. I really believe we need to get serious about taxing unearned income at a higher (rather than, as currently, lower) rate than earned income. What is so perverse about the argument in my view is the cynicism. One apparently cannot be well-off and left of centre without being a hypocrite. Which is of course ridiculous. In so many areas of life people act out of altruism. Many argue vociferously that taxes should be minimized because 'what I earn is mine and you shouldn't take it away.' This appeal to the moral is deeply misguided in my view because it's grain of truth will not stretch anywhere near that far. Firstly, as I said unearned income is taxed way below earned income. We live in a rentier society. Moreover 'I earned it' misses out several key steps; any wealth any of us can have depends entirely on living in a secure society to make that possible. It depends on educational opportunites it depends on the infrastructure of the nation that makes wealth generation possible, it depends on national security, it depends on access to healthcare - and also to the general health of those around me (being in a healthy society makes me less at risk of disease). It also, incidentally depends on access to the earth's resources (such as land and energy and raw materials) which apparently don't somehow belong to all of us. Surely those who benefit most from these things should pay the most towards them. And do so proportionally. However this is not the main issue. The main issue is that systematically we have a rent-based economy which is designed for (and very effective at) concentration of wealth. The great lie of my generation is that wealth is achieved on merit. It really isn't. So we have a system that makes the rich richer and the poor poorer and then blames the poor for their own poverty. To be against this and poor is to show class envy. To be comfortable and against it is hypocrisy; as if many don't work very hard and far more than they are paid for and produce social goods and give generously to charity. And yet if you think this, apparently you're not allowed any luxuries. Whereas if you tell yourself and the world that you deserve everything you have then it's ok to sneer at the poor and disadvantaged. So anyway, I am and suspect, I will always remain a socialist. Proudly believing in democracy, proudly believing in our collective responsibility to each other - and still drinking the occasional single malt. P.S. This is number two on my list of phrases that immediately identify the person using it as an idiot. 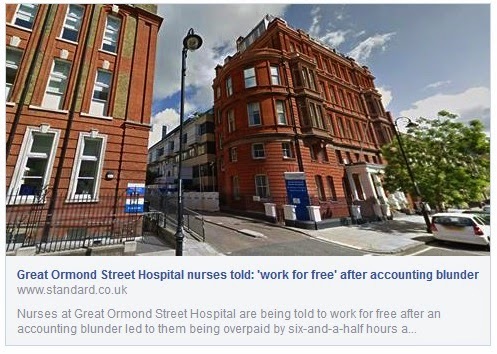 So, according to this story, due to an accounting error, nursing staff at the emblematic Great Ormond Street Hospital have been overpaid by 6.5hrs worth and the hospital wants it back. The chief nurse has written to nursing staff, telling them to work additional shifts to make up the time. The problem with this story is how is doesn't remotely surprise me. Several years ago a hospital trust I worked in sent a similar email to all the ward sisters; which one of them showed to me. A period of very heavy snow resulted in many staff struggling to get in to work. The email told all ward sisters that as a matter of policy any member of staff who arrived late due to the weather would be expected to work through breaks or stay late to make up the time. No 'thank you' for the huge efforts some had to make to get in, just a clear expectation of time 'owing' being paid back. Just for the record, I want to state that, as anyone who's ever worked in a hospital or seen the inner workings knows, it is very much a normal day when clinical staff work through breaks or stay late because of a caring attitude and/or professional responsibility. Indeed, if I was a union rep in GOSH, my response would be to send the management of the hospital a bill for all the unpaid overtime that is done by virtually all nursing staff. I can assure you that it would be a lot more than 6.5hours/year. For many medical staff I know, 6.5hours of unpaid overtime would constitute a quiet week. For me though, what makes me very annoyed about these stories, is not the unjust nature of it. That is not to say that doesn't bother me, it really does: it's a big slap in the face to a hardworking and dedicated workforce. It is plain wrong. However the stupidity of the management decisions bothers me even more. Nursing morale is at an all-time low. With significant justification, many public-sector workers feel deeply un-valued by their employers and society at large. It takes something special to do difficult work with enthusiasm and dedication. This kind of nonsense from management only serves to further undermine the wellbeing of not just nursing staff but all staffing groups. I can assure GOSH's managment that a rise in staff turnover which is not remotely unlikely will cost a lot more than £80,000.